The Smoothwall makes use of RADIUS accounting to allow users to connect their own wireless devices to the network, known as “bring your own device” (BYOD), and authenticate unobtrusively. This has the added advantage of not having to install additional software on the users’ device. The Smoothwall links your organization's directory service to its RADIUS server. As a network administrator, you can configure your wireless network infrastructure to authenticate users using the RADIUS server so that users can use their directory service accounts as wireless client login details.  Accounting — A request to inform that the user has left or joined the wireless network. Typically, this is sent by the network access server (NAS) acting as the RADIUS client. The Smoothwall uses this request to physically log the user on or off the network.  Authentication — A request to confirm that the supplied user credentials are valid, and the user authorized to join the wireless network. Typically, this is sent by the network access server acting as the RADIUS client. The Smoothwall can only receive requests via an Extensible Authentication Protocol (EAP) tunnel, with an Microsoft Challenge-Handshake Authentication Protocol (MSCHAP) handshake. You can define groups to explicitly allow or reject the authorization requests.  Filter-ID — This is an optional attribute, used to supply the authentication group of the user. Typically, the group assignment is used by the Smoothwall when there is no directory service configured to use for group mapping.  Framed-IP-Address — This contains the IP address of the client that has been authorized to join the wireless network. This attribute is essential to the BYOD service.  Interim-Update — This is a status update received from the network access server, advising of the status of the client’s session. If the Smoothwall does not receive this at least once an hour, it assumes the session has ended and logs the client out. The following describes possible implementations for using BYOD with the Smoothwall. You can choose to configure the Smoothwall to be the DHCP server, and the RADIUS server for both authentication, and accounting requests. Note: Note that a Unified Threat Management serial is required to use DHCP. For more information, contact your Smoothwall representative.  The Smoothwall is the DHCP server, therefore does not perform DHCP relays for the wireless network. The Smoothwall must be on the same subnet as the network access server for this to work. This implementation is similar to the Smoothwall Provides Accounting Services implementation, except the Smoothwall provides greater control over authentication services. 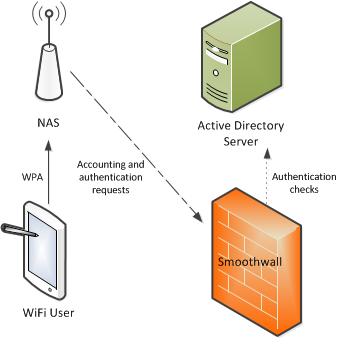 The Smoothwall will authenticate the user, and authorize them to the wireless network. However, the Smoothwall is informed of the IP address assigned to the user in the RADIUS accounting packet received from the network access server. This will be contained in the Framed-IP-Address attribute. You can delegate user authentication and authorization to the wireless network to the network access server, and only use the Smoothwall as the RADIUS server which will receive accounting requests. 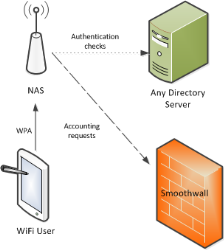 Typically, the Smoothwall will use the accounting requests to log the user on or off the network — for this to work the network access server must include the Framed-IP-Address attribute (as well as Accounting-Start or Accounting-Stop) in the RADIUS accounting packet to the Smoothwall.  The network access server can use any directory service to authenticate the user.  In the network access server, the Smoothwall is configured as the RADIUS server which will receive accounting requests.  The network access server must send an Interim-Update at least once a hour to confirm the user’s session is still active.  If supported, the network access server must be configured to send the users’ IP address in the Framed-IP-Address attribute of the RADIUS accounting packet, otherwise the IP address of the network access server will be sent instead. This will lead to the Smoothwall being unable to log individual users on or off the wireless network.  You can add a directory service Type of RADIUS accounting to the Smoothwall, to indicate to it that all authentication and authorization requests are provided by an external RADIUS server. You must add group mappings in the Smoothwall to map the RADIUS group, to the Smoothwall groups. For more information, see Managing Groups of Users.  Optionally, to support group mappings, the network access server must be configured to send the Filter-ID RADIUS attribute in the accounting requests to the Smoothwall. The Smoothwall must also be configured to authenticate the users. 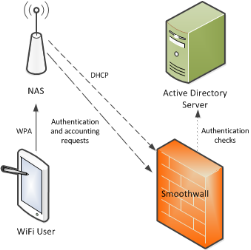 Note: It is also possible for the Smoothwall to just provide DHCP services, and receive RADIUS accounting requests if the network access server is configured to connect to a directory service for authentication and authorization to the wireless network. Note that a Unified Threat Management serial is required for this. For more information, contact your Smoothwall representative. Using BYOD is possible in a Multi-Tenant configuration, with the client’s IP address passed in the Framed-IP-Address attribute denoting the tenant membership. Typically, you add all network access servers’ IP addresses into the same tenant as the clients they are serving.This is essential if the network access server is unable to support sending the client’s IP address in the Framed-IP-Address attribute (the Smoothwall would receive the IP address of the network access server instead), or if Framed-IP-Address is not sent in every accounting packet. This is to ensure users receive the correct web filtering policies. For more information about licensing and using the Multi-Tenant feature, see About Multi-Tenant Managed Services. A BYOD service in a centrally managed solution, could potentially be configured with any of the implementations previously described. You can choose to configure the parent Smoothwall node as the primary RADIUS server, with the child nodes acting as extra RADIUS servers receiving forwarded accounting packets. It is also possible to configure more than one Smoothwall to act as the RADIUS server for the network access server, with each processing a different RADIUS request. Note: Nodes from a centrally managed solution are not added automatically to the BYOD configuration. You must add them separately to the Forward RADIUS accounting to panel located at Services > Authentication > BYOD. For more information, see Adding External RADIUS Servers. For a detailed description of how to implement a centrally managed Smoothwall, see Setting up a Centrally Managed System. Additionally, the NAS must be able to act as a DHCP server to provision the wireless device with an IP address.  Users’ wireless devices must support WPA Enterprise with Protected Extensible Authentication Protocol (PEAP), and Microsoft Challenge-Handshake Authentication Protocol (MSCHAP) version 2.  If a web filtering policy is applied to users, Guardian must be configured to use core authentication. For more information, see Creating Authentication Policies.  Active Directory must be used to authenticate users to the wireless network. Note that no other directory services are supported if the Smoothwall is the authentication server, including the legacy method of using Active Directory. For a detailed description of how to configure the Smoothwall to connect to an Active Directory server, see …About Directory Services.  You must enable DHCP on the Smoothwall, and configure a valid DHCP subnet. For a detailed description of how to do this, see Enabling DHCP.  All network access servers must be located in the same subnet as the Smoothwall. Network switches can be used, but there must not be any routers between them. Again, the Smoothwall must be the DHCP server for that subnet.  The Smoothwall must act as the RADIUS authentication and accounting server. 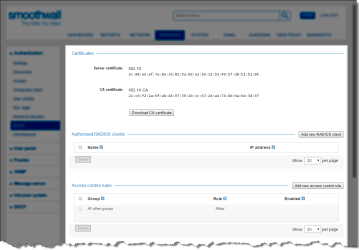 The prerequisites listed in When Smoothwall is the RADIUS Authentication Server also apply. Note: For a detailed description of how to configure the access points, refer to your documentation for the network access server you are using.  The wireless network added to, or modified in the network access server must use WPA2 with 802.1X. • The wireless network type may be referred to as WPA2-Enterprise, WPA2-RADIUS, or WPA2 with a separate option for RADIUS accounting. WPA2 is the most secure. To support older hardware, WPA1 is also supported. Some network access servers may support WPA1 and WPA2 simultaneously.  Some network access servers require you to enter the Smoothwall’s details twice, if the Smoothwall is the RADIUS server for both authentication and accounting. The Smoothwall uses port 1812 and 1813 to send and receive RADIUS traffic. You must add access rules through the Smoothwall firewall to allow traffic from BYOD devices. You must add the RADIUS clients’ details that are authorized to connect to the Smoothwall. Depending on your network configuration, the RADIUS clients will either advise of user authentication and authorization, or send a request for the user to either be authenticated, authorized for access, or both. 1. Go to Services > Authentication > BYOD. 2. 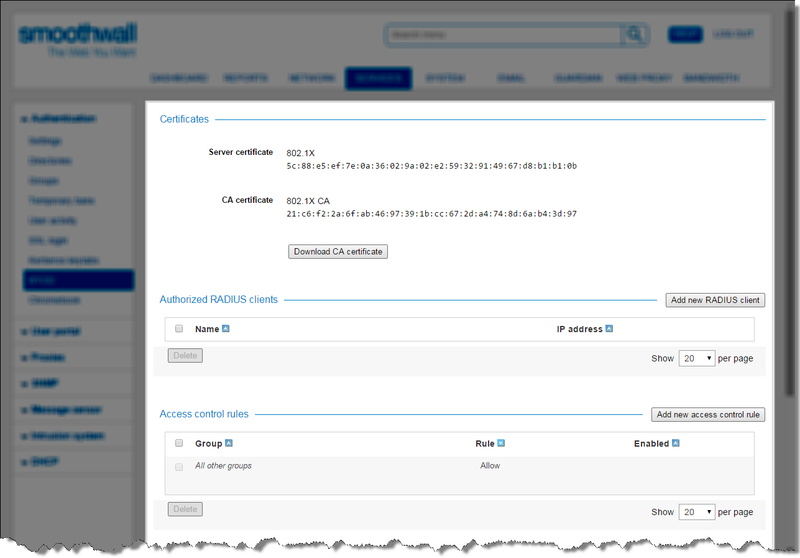 Scroll down to the Authorized RADIUS clients panel, and click Add new RADIUS client. • Shared secret — Enter the shared secret (password) that will be used by this client to successfully communicate with the RADIUS server. It is recommended you use a minimum of eight characters, using a combination of alphanumeric and punctuation characters. • Confirm — Re-enter the shared secret. Do not copy and paste from the previous text box, as this may copy any errors. • Comment — Configure an optional comment for this server. An additional button, Show comments, appears on the Authorized RADIUS clients table if any comments are configured. Clicking this will display configured comments under the client name. 2. Scroll down to the Authorized RADIUS clients panel. 3. Highlight the relevant RADIUS client, and click Edit. 4. Edit the configuration as required. For a detailed description of each setting, see Adding RADIUS Clients. 3. Highlight the relevant RADIUS client. Note: This is a complete block to the wireless network, not just to the Internet. You can use Guardian to block access to the Internet, but still allow access to the wireless network. For a detailed description of how to do this, see About Guardian Policies. You can add rules to block access to the wireless network according to group membership. A default rule, All other groups, is provided as a "catch-all" for those cases where a user group does not have an associated access control rule. The default behavior is to allow access to the wireless network. Note: The Access control rules table is not an ordered table of rules. Block actions take precedence when rules overlap, such as when a user is a member of a two groups, where the behavior for one group is to block but the other to allow. 2. Scroll down to the Access control rules panel, and click Add new access control rule. • Status — Clear the selection if you do not want this group to use access control rules. • Group — From the drop-down list, select the relevant group for this rule. • Rule — From the drop-down list, select whether this rule is to Allow access to the wireless network, or to Block access. • Comment — Configure an optional comment for this rule. An additional button, Show comments, will be displayed on the Access control rules table if any comments are configured. Clicking this will display configured comments under the group name. For a detailed description of how to add groups to the Smoothwall, see Managing Groups of Users. 2. Scroll down to the Access control rules panel. 3. Highlight the relevant rule, and click Edit. 4. Edit the configuration as required. For a detailed description of each setting, see Blocking Access to the Wireless Network. Typically, the Smoothwall acts as the RADIUS server, but will act as the client when it needs to forward RADIUS accounting data to upstream servers, such as, a billing system, or a captive portal. This can also be other Smoothwall nodes in a centrally managed solution. If the Smoothwall is to forward RADIUS accounting requests to an additional server, you must configure the servers that will receive the RADIUS accounting packets. 2. Scroll down to the Forward RADIUS accounting to panel, and click Add new RADIUS server. • Shared secret — Enter the shared secret (password) that will be used by connecting RADIUS clients to successfully communicate with this server. An additional button, Show comments, will be displayed on the Forward RADIUS accounting to table if any comments are configured. Clicking this will display configured comments under the server name. 2. Scroll down to the Forward RADIUS accounting to panel. 3. Highlight the relevant RADIUS server, and click Edit. 4. Edit the configuration as required. For a detailed description of each setting, see Adding External RADIUS Servers. 3. Highlight the relevant RADIUS server. If authentication services are provided through the Smoothwall, you may find that some devices may not automatically accept the Smoothwall’s certificate when users try to authenticate onto the wireless network. You can download the Smoothwall’s certificate, and make it available in a way supported by those affected devices. 2. From the Certificates panel, click Download CA certificate. 3. Copy the certificate to a secure location, then import it into the devices’ browser. For a detailed description of how to import certificates, refer to the devices’ accompanying documentation. Our knowledge base article How do I Stop the MITM Attack Warning When My Users are Using BYOD? is available to guide you through the necessary steps.